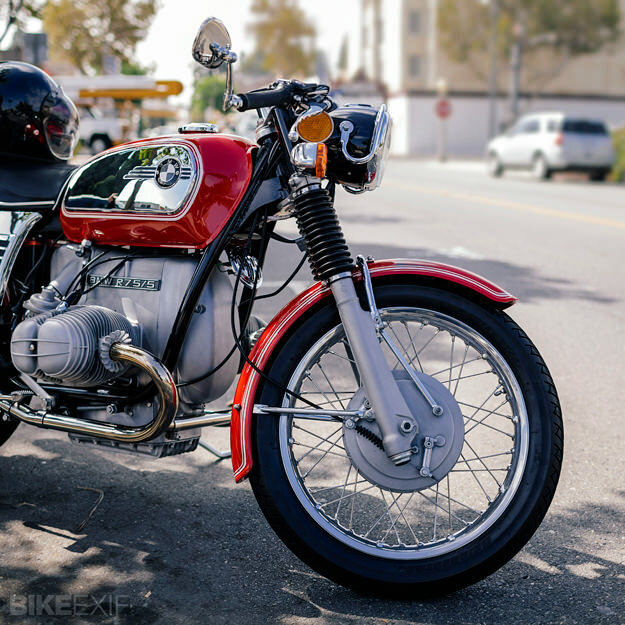 There’s something magical about a classic 70s BMW airhead: Slightly oddball lines, that remarkable engine, and the promise of fine German engineering. An off-kilter charm, if you like. 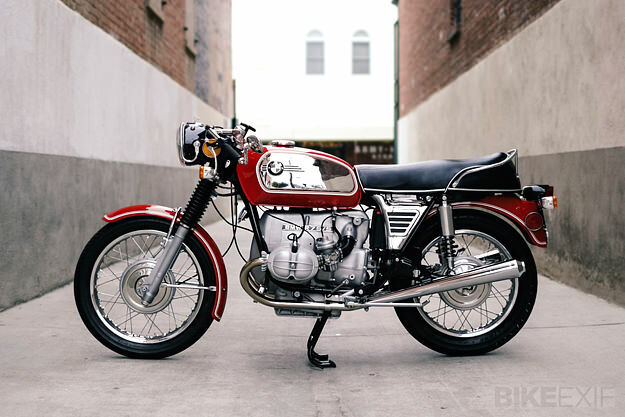 This BMW R75/5, however, is not quite what it seems. It’s a subtly modified 1972 model that has been customized during a ground-up rebuild. And it looks as fresh as the day it rolled out of the BMW Motorrad Werk factory in Berlin. The craftsman responsible for this ‘traditional custom’ is Brandon Mungai, who restores old BMWs out of a garage in Costa Mesa, California. 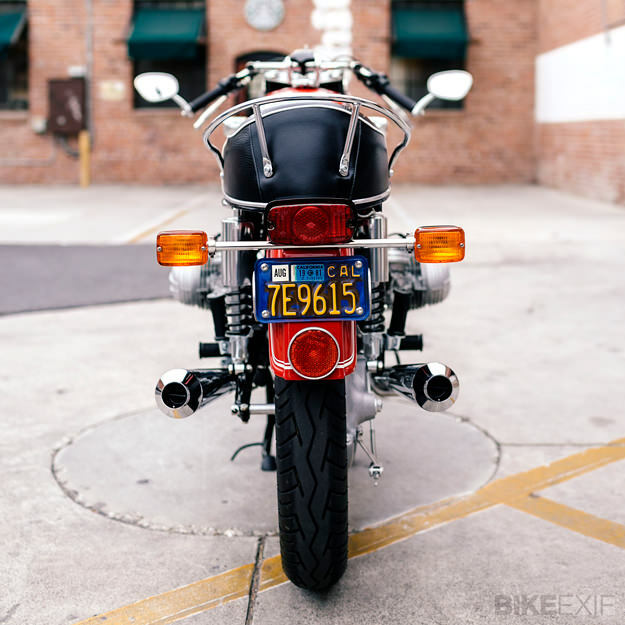 Since 2011, he’s been chronicling these builds on the Bavarian Cafe website, and this R75/5 is his latest creation. Brandon came across the /5 a few weeks after he survived a near-fatal crash on a similar bike. While taking time to recover, he felt that a new project would help his rehabilitation—and before he knew it, he was tearing the bike down, bolt by bolt. It was an all-original 54,000-mile machine that had been parked under an awning since 1981. 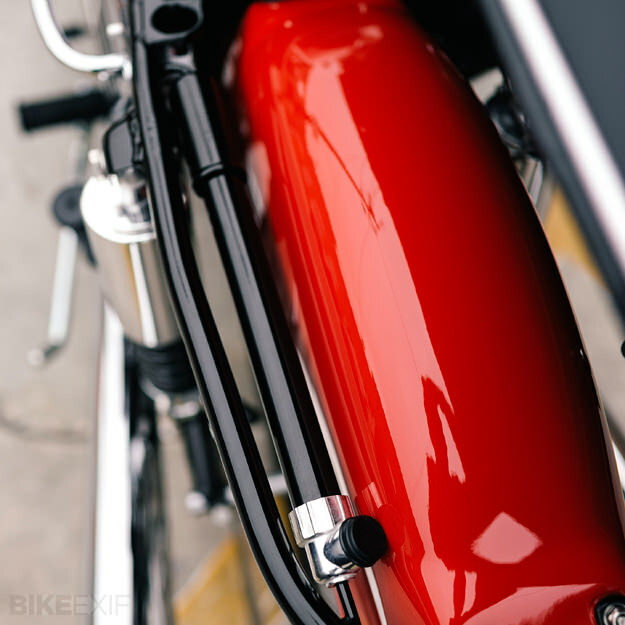 Brandon is a purist at heart, but also has a strong affection for cafe racers, so he decided to add a few period-correct mods and keep the rest of the bike original. If ever the day came when he wanted to convert it back to stock, a short time in the garage would be all that was needed to do the trick. 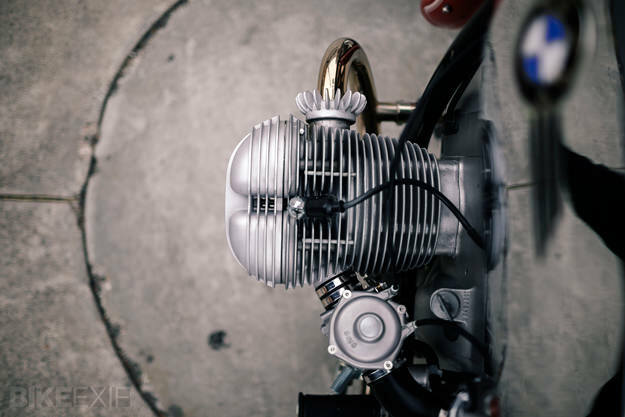 The build was unusually thorough: “The crank journals have been re-polished, the cylinders re-honed and the valve seats and guides resurfaced by John Edwards at Costa Mesa R&D,” Brandon reports. New Karcoma petcocks deliver fuel to the rebuilt Bing carburetors, and Brandon secured a stainless steel exhaust and Hoske Silencers from the specialist S. Meyer in Germany. “I also located a five-speed gearbox from a 1977 R60/7, and replaced all the bearings, shifting cam springs, gaskets and seals. A 32/10 final drive was re-splined by Hansen’s BMW up in Oregon. 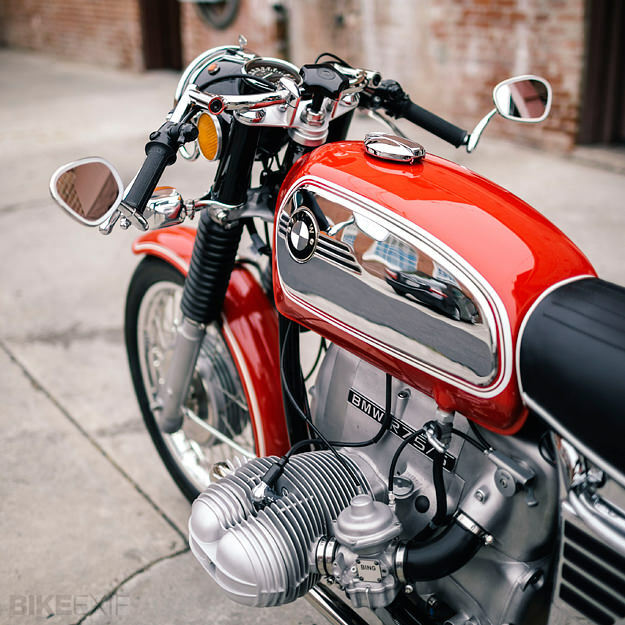 The shocks are /5 replicas from Bob’s BMW.” Stainless steel spokes interlace the highly-polished Wiemann rims, and Brandon installed a reproduction SWB seat—complete with seat lock—plus a tool-kit, an air pump and a chrome headlight ring protector. A new Brown-style sidestand and vintage Albert bar-end mirrors were supplied by Bench Marks Works in Mississippi. The ‘toaster’ panels were re-chromed and the speedometer was rebuilt. Tommaselli adjustable Clubman Bars were imported in from Italy to guide the controls, and a ton of OEM parts were located and delivered by the crew at Irv Seaver BMW in Orange, CA. A suitability classy name for a grand—and slightly racy—old lady. See more of Brandon’s work on the Bavarian Cafe website. Photography by Shaik Ridzwan from The Mighty Motor.